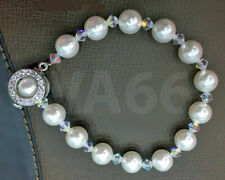 Material: Crystal,Pearl. Type: Hair Combs. Style: Fashion. Genuine three strand baroque cultured pearls. 7.5mm to 8mm. There is a large sterling clasp with crystals and pearls. Shape: Spherical. Type: Natural Freshwater Pearl. Style: Solitaire with Accents. Material Purity: Solid 14K Yellow Gold. Ring Setting Side Diamond Shape: Round. Center Stone. Composition: 14k Gold Marked. Center Gem Stone: 1x=Pearl. Gem Stone: 6x=Diamond. If you ever have a problem, we want to take care of it! Photos: We’ve spent 1000’s of hours working to perfect the perfect photo. C925 Sterling Silver & White Freshwater Pearl Threader Earrings. Threader Earrings. Stylish sterling silver threader earrings with highly polished finish. 925 Sterling Silver Freshwater Pearl. Solid bar with freshwater pearl dangles from the front of the ear. Very Beautiful and Gold Plated South Indian Jewelry Set Studded With High Quality Multi Stones & Pearl beads. 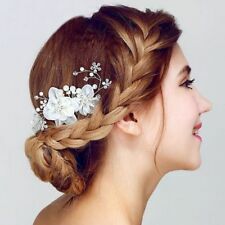 Latest trend and very popular this season. Adjustable Necklace Cord For Fit To All. BEST WISHES FOR YOUR HAPPY LIFE. This wedding jewelry set includes a fantastic rhinestone pearl necklace and a pair of fancy earrings. 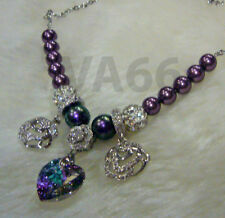 Wearing this shining rhinestones pearl necklace and earrings set, your charm can be fully shown. Gold 9ct, 9K, 375 Solid White Gold. All our jewelry has been crafted with genuine natural gems by our professional team of jewellers. also available in yellow or rose gold. Our diamonds are REAL Earth-mined diamonds - NOT 'created diamonds', simulates nor cubic zirconias (CZ). We will respond within 24-48 hours, in most cases sooner. Genuine graduated cultured pearls. There is a 14K white gold filigree clasp. check out the pictures for closer details. 925 Sterling Silver 10mm Sleeper Earrings With White Freshwater Pearls. Highly polished sterling silver sleeper with white freshwater pearl. Material: 925 Sterling Silver & Freshwater Pearl. 925 Sterling Silver 10mm Sleeper Earrings with Pearlsg. Material: 925 Sterling Silver. Stones: Pearl & Topaz. Stamped: 925. Plating: White Gold Plated. Free Gift Box. Adornale Jewelry is Handmade Designer Jewelry. In case you need any clarification or information about any of our products, pls. We shall get back to you within 24-48 hrs. About the ADORNALE Jewelry. Size：9mm to 12mm〔ideal is 10mm〕. ★Side Stones：100% Genuine Natural Diamonds. Shape：Round Single Cut. Shape：Round. You will get response within 24 hours. we are very glad to help you. Service you wholeheartedly. 14K White Gold Natural Diamond & Sapphire & Freshwater Pearl Ring. Style: Diamond & Sapphire & Pearl Ring. Gem Type: Natural Freshwater Pearl. Small Blue Sapphire: 0.552ct. Diamond Wedding Jewelry. Setting Pendant. One Choker Necklace. One pair Slave Bracelets (Haathpanja). Bridal Complete Necklace Jewellery Set. “Actual colours may vary from the colour shown on your screen, as monitor settings may vary from individual to individual.”. Composition: 14k Gold Tested. Gem Stone: 2x=Pearl. If you ever have a problem, we want to take care of it! Photos: We’ve spent 1000’s of hours working to perfect the perfect photo. Our goal is to photograph it in a way that allows you to see what the item will look like when it is in front of you.